Who is the Patron Saint of Money? Why is Saint Matthew the Patron Saint of Money? Who is the Patron Saint of Money? The name of the Patron Saint of Money is Saint Matthew. What is the meaning of a Patron Saint and why were these people chosen to become patrons of causes, professions and countries? 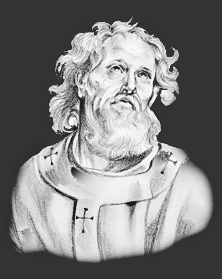 Click the following link for a detailed Biography of Saint Matthew the Patron Saint of Money. There is a patron for virtually every cause, country, profession or special interest. Prayers are considered more likely to be answered by asking a patron, such as Saint Matthew the Patron Saint of Money for intercession on their behalf. Why is Saint Matthew the Patron Saint of Money? Because he was originally a tax-gatherer who collected money in the service of the Romans. It is helpful to be able to recognise Saint Matthew the Patron Saint of Money in paintings, stained glass windows, illuminated manuscripts, architecture and other forms of Christian art. The artistic representations reflect the life or death of saints, or an aspect of life with which the person is most closely associated. Saint Matthew the Patron Saint of Money is represented in Christian Art with a purse or money-bag. Occasionally we find him seated at a desk, with money spread out before him. The Feast Day of Saint Matthew the Patron Saint of Money is September 21st. The origin of Feast Days: most saints have specially designated feast days and are associated with a specific day of the year and these are referred to as the saint's feast day. The feast days first arose from the very early Christian custom of the annual commemoration of martyrs on the dates of their deaths at the same time celebrating their birth into heaven.